Zhan Zhuang means "standing like a tree" and is pronounced "Jan Juang", or, in southern China, "Jam Jong". For most people, training in Zhan Zhuang is a complete surprise in the beginning. There are no recognisable external movements, although it is a highly energetic exercise system. In contrast to many other methods, Zhan Zhuang develops our internal energy in a very efficient way, instead of consuming it. Zhan Zhuang Chi Gong is practised in well-balanced standing positions which increase the flow of energy and build up internal strength. The Zhan Zhuang system is based on a unique fusion of exertion and relaxation which stimulates, cleanses and internally massages the whole organism. Qigong (pronounced "chee-gong"), may be China's best kept secret. Suppressed during the Cultural Revolution, awareness of this method of exercise has exploded throughout China, where currently 200 million Chinese practice some form of qigong regularly. Hospitals throughout China overflow with reports of cures of myriad conditions using any of hundreds of forms of this art. Qigong means "an exercise to develop chi, (also spelled qi) "the energy of life." 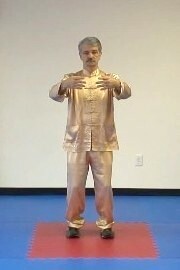 This particular form of qigong, Zhan Zhuang, is about four thousand years old, and is used from everything from building strength for martial arts to self-healing, lowering blood pressure, increasing respiration and alertness, reducing stress and pain, and improving health and energy overall. Zhan Zhuang means "standing like a tree," aptly called, because all the Zhan Zhuang postures are performed standing, in utter motionlessness. 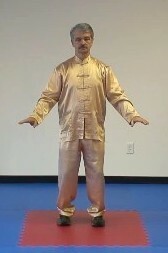 This form of Zhan Zhuang was the method used by Wang Xiang Zhai, the grandmaster and founder of the newest "soft" Chinese martial art, dazhengquan. 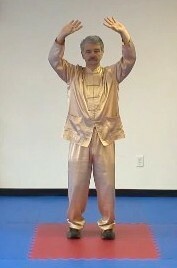 Perhaps "standing like a tree" does not sound powerful, but Wang made it the foundation of his training. For a long time, Zhan Zhuang Chi Gong has been a well kept secret and it is only since the mid 40s of this century that it has been taught and discussed publicly. 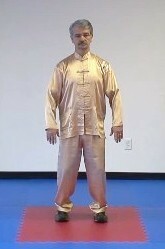 In Europe, Master Lam Kam Chuen introduced it in 1987. He is also the author of the first book on Zhan Zhuang in the West. Through the practice of Zhan Zhuang Chi Gong we're able to take advantage of our whole potential, both physically and psychologically, without becoming exhausted. This is achieved in a completely natural way without the need for fighting ourselves.